The Tony, Olivier and Grammy Award-winning Best Musical Jersey Boys celebrates its 8th year on Broadway Wednesday, November 6, 2013. 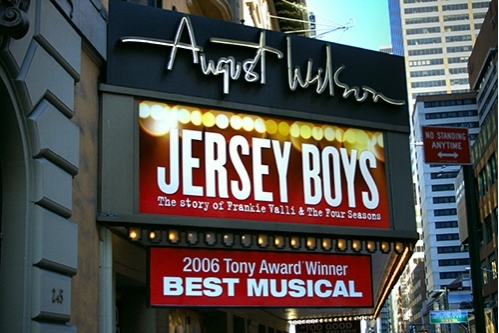 Jersey Boys opened on Broadway to critical acclaim at the August Wilson Theatre. The show has been seen by over 18 million people worldwide and is currently playing in New York; Las Vegas; London; in cities across the U.S. on a National Tour and in The Netherlands. Buy Jersey Boys August Wilson Theatre Tickets NOW! Jersey Boys is currently the 15th longest running show in Broadway history, having recently surpassed the records held by Fiddler on the Roof and Hello, Dolly!. The Broadway company stars Matt Bogart (Nick Massi), Drew Gehling (Bob Gaudio) and Andy Karl (Tommy DeVito) and Dominic Scaglione, Jr. (Frankie Valli) with Peter Gregus and Mark Lotito, and Miles Aubrey, Erik Bates, Candi Boyd, Cara Cooper, Jared Bradshaw,Joseph Leo Bwarie, Ken Dow, Russell Fischer, John Edwards, Katie O’Toole, Joe Payne, Mauricio Perez, Kyli Rae, Nathan Scherich andSara Schmidt. Click here to Buy Jersey Boys New York NY Tickets Online.